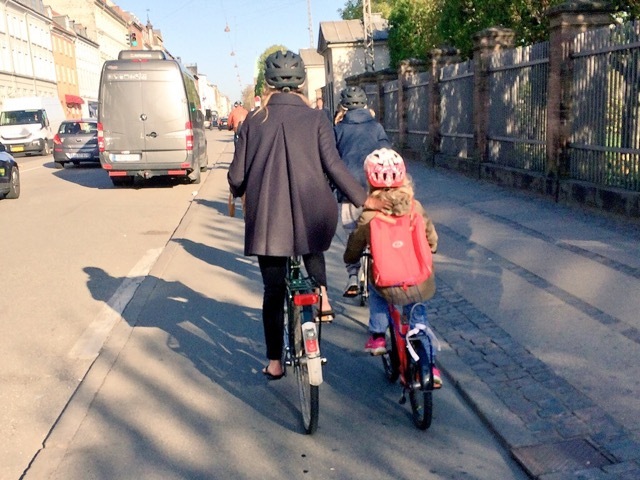 You quickly learn to keep right on a busy bike track as a newbie from a lefty-land, and that’s where you’ll find the kindergarten kids cycling to school on their own bikes, with either a parent giving a helping hand alongside or shadowing directly behind. Once you’re amongst the crowd on the correct side of the street, ‘keep right!’ isn’t something you need to give any conscious thought to – you have the visual indicators of the pavement on one side and the road on the other. Pavement slow and objectively safe, road fast and subjectively scary, and within the bike track itself an effective gradient of increasing speed running out from the pavement towards the road. I don’t think the kids or I were putting any mental effort into trying to remember our right from our left – we were just instinctively staying out of the way by keeping to the edge. When you get to the junctions the bike tracks disappear and there isn’t always a blue strip of paint to act as a guide (more on that later). It’s a minimalist, open plan junction design and it can get the anxiety levels up until you’ve spent some time practising it and know what to do. This one is on the corner of Tivoli Gardens (upper far right) and was on my route to the station from Christianshavn. I’m waiting at the lights to go straight on – a fairly trivial manoeuvre. The cyclist in front has come from the left of shot, having been riding alongside the huge HC Andersens Boulevard, and wants to go up past Tivoli Gardens in the same direction as me. As a recent graduate of the 2-stage turn I can tell you she’s positioned herself in the perfect spot. She’s ahead of the pedestrian crossing but behind the invisible bike lane she would have been in if she’d ridden straight on and out of shot on the right. That’s the difficult part of this manoeuvre – finding the right spot to stop so you’re not hindering anyone else. Not all junctions are the same shape or laid out with the same spacings and after three days at least one our group remained uncomfortable with reliably finding that spot, feeling some indication is needed of where it is. 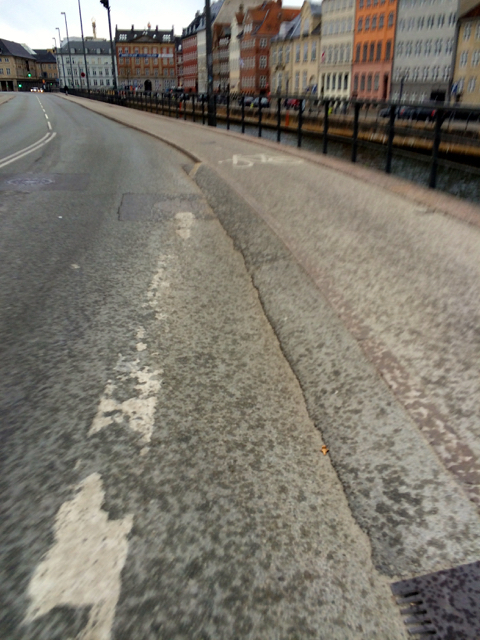 This is where danish and dutch infra really differ – comfort in the form of reassuring kerbs at junctions. As good as it is (and they’ve been improving it for thirty years or so) the network of tracks isn’t complete or perfect; there isn’t always a track between junctions. This shot is of a slightly special case (result of a construction project behind the camera) showing the transition from a cycle lane to a cycle track facilitated by squirting a fillet of tarmac along a kerb edge. You see this form of instant dropped kerb a lot, and they don’t all look like they’re temporary interventions. Not pretty, but cheap, fast and functional. This one runs alongside a waterway – on my route in to the centre from Christianshavn again – doesn’t have a footway (there’s one on the other side of the street) and leads to an example of what I’d suggest is the weakest link you’ll come across in Copenhagen’s cycle network. Despite appearances, this is not a right-turn-only-bike-lane. I came across one of these when I arrived and was fretting about what kind of detour I would have to make, but even at 10:30 on a Sunday night there are still other people riding around and, fortunately, I just followed the woman in front who went straight on. It’s a bike lane AND a right turn only filter lane for traffic. The cycle track becomes a cycle lane about twenty metres before the junction, and the right turning traffic feeds into it. Clearly Copenhagen has junction capacity issues that impact adversely on cyclists too, but the city council are trying to remove them. People either filter past the vehicles to the front or they hang back in the queue until the traffic has turned. As you can see, they have HGVs in Copenhagen which raises the question: are there as many and is the ‘London problem’ with turning lorries as prevalent? Googling suggests that’s a topic worthy of it’s own post [see David Hembrow’s comment with link to post below]. Right turning vehicles (the equivalent to our ‘left-hookers’) are subject to another rule that appears to be ‘give way on turning right’ and applies to cyclists too with respect to pedestrians. I haven’t got my hands on an english copy of the Danish Road Traffic Act yet, but that’s my interpretation of what I saw there. Coming from the UK, passing along the nearside of a vehicle that’s indicating and patiently waiting for a gap in the cycle traffic before turning right, tends to stick out as an unusual behaviour. Except I’ve also seen it in London. Heading west along Cable Street (one way for motor vehicles) the layout, excepting the two-way track, is remarkably similar to situations in Copenhagen and is probably why it came to mind. Also it stuck in my mind because it happened twice in quick succession, first a van driver, then a car driver, both wanting to turn right, both patiently giving way to people on bikes. Coincidence or a regular occurrence? I need to go back there and gather some evidence, but for me it raises the question of whether it’s the rule, the legislation, that’s creating that behaviour, or whether the behaviour means you have a rule that tends to work. The other legislative rule that’s often used to explain this kind of behaviour is presumed liability, but that’s another topic that deserves a post of its own. Suffice to say it doesn’t explain what I witnessed on Cable Street, although when situations like that do go wrong, wouldn’t it be a humane way of sorting it out? Getting back to ‘keep right!’, another part of CS3 that sticks in my mind, this time because it caught me out, is the section along Horseferry Road. It’s a one way street with a contraflow bike lane on the Copenhagen side of the road. Would a contraflow cycle lane on the London side of the road be a no-no in Copenhagen? Is the ‘keep right!’ rule maintained that rigorously? It’s certainly applied rigorously enough to prevent an exception for buses. The ‘keep right!’ rule is maintained along bus routes and through bus stops. There is a rule about giving way to bus passengers, and that’s precisely what happens as a bus pulls up at a stop and the doors open – people on bikes slow up and wait for those getting on and off. Is there a rule covering the same arrangement in Royal College Street? I don’t think so, but the behaviour appears to be the same regardless. 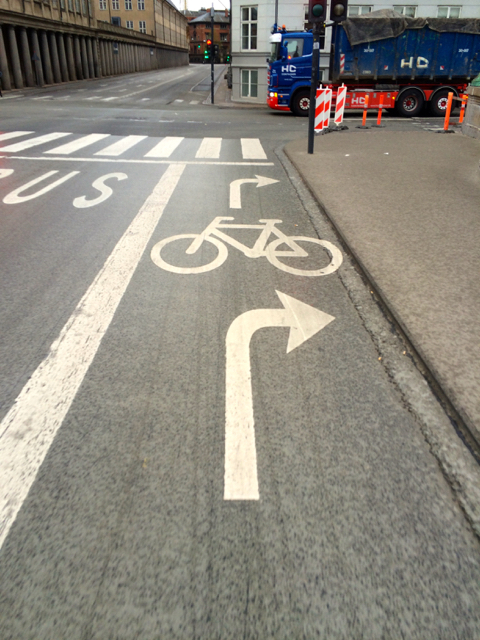 In the case of Copenhagen, can the ‘keep right!’ rule be credited with the introduction of the cycle track(s)? If so, it can probably be credited with the policy of putting people on bikes on the pavement side of parked cars – a stepped track automatically results in parking moving out and staying within the road. Going back to the 2-stage turn: isn’t it simply a consequence of rigorously applying the ‘keep right!’ rule? There’s very little in terms of infrastructure or on-the-ground-guidance, apart from the example of others, to enforce the behaviour, so it seems that it’s simply the knowledge of the rule(s) that make it work. Or perhaps it’s one of those rules that tends to work because it’s natural to keep out of the way of perceived danger and keep to the edge. And what about driver behaviour? Imagine an equivalent signalised junction in London during the morning rush and try to plot where cyclists will be. Drivers might use words like ‘everywhere’ or ‘anywhere’. Does that lack of predictability have consequences? 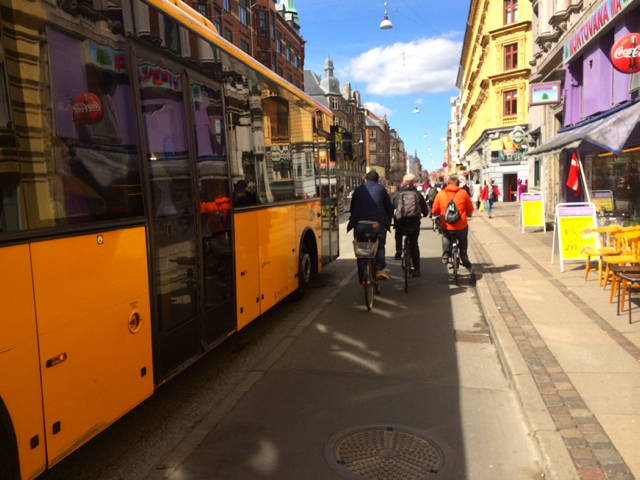 Does the predictability of where people on bikes are likely to be found in Copenhagen – on the right – make them easier to interact with and even reinforce their ‘right’ to be there? What might Daniel Kahneman discover if he were to research which factors influence driver behaviour, and would they match the rational arguments such as ‘play nice and share the road’ being used to encourage ‘good’ behaviours here? Put another way, is it worthwhile, or even possible, to implement give-way-when-turning and presumed liability rules in the UK without a more rigorous implementation of our own ‘keep left!’ rule? I’m thinking of both acceptance of it into law, and compliance once it is. Perhaps, amongst all the nice cycling stuff we can observe in Copenhagen, there’s also a quid pro quo evident when it comes to ‘sharing space’ that’s required in order to achieve successful cycling rates in a motorised city. For example, I don’t remember seeing an advanced stop box while I was riding round Copenhagen, but then 3 days may not have been long enough. I could always go back and search for them using one of these. Oh, and those blue strips at junctions. Apparently there’s a Danish research paper available [link to come] that has found too many blue strips – more than two at a junction – leads to higher collisions or injuries. What’s that all about? There’s no need to wonder about the safety of Danish cyclists in mixing zones where right turning motorists and cyclists use the same lane because we have known for years that this is a lethal junction design. 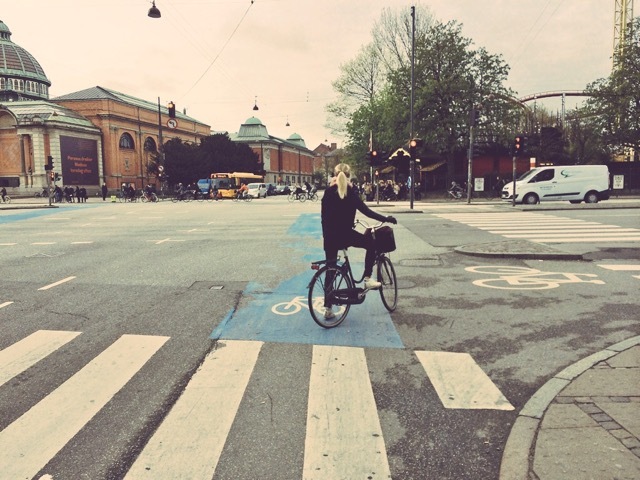 These junctions killed seven Copenhagen cyclists in 2013. It’s not safe in Denmark and it won’t be safe in other countries either. It’s hi time that people stopped touting this idea. As for “touting this idea”, I’m not sure what that’s got to do with this post. 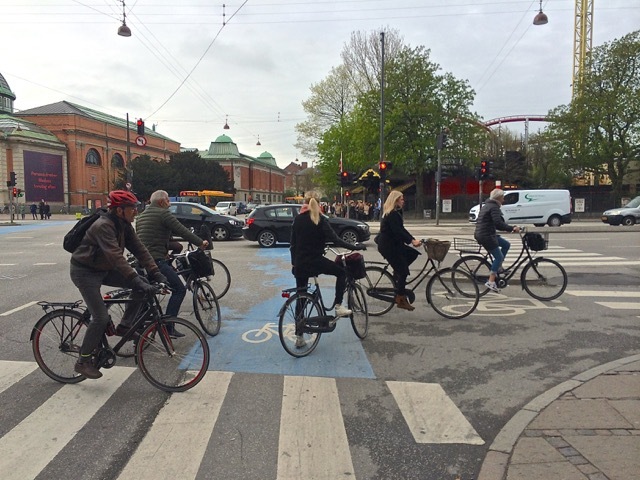 Even an amateur like me can see the shortcomings of these “mixing zones”, and I described the one pictured as “…an example of what I’d suggest is the weakest link you’ll come across in Copenhagen’s cycle network.” Hardly a ringing endorsement. I suggest something must have been clouding your objectivity when you read it. Because you’ve already made this journey, and famously produced a fantastic guide to it, does that mean the rest of us should be prevented from making it too? I think shared experience might be the key to bringing people with us, and arguably you’ve done more to advance that than any of us. Did your ‘extra’ tour for previous participants run this year?